Leaders in the respective categories of the Men’s category after Day One are Avinash Persaud (centre), Seepaul Sknanan and Patangilee Persaud. one in the Digicel 2014 Guyana Open Golf Tournament which is being played at the Lusignan Course. Persaud finished the day on a net 72 and who is a multiple times champion, leads a strong field that also includes defending champion Avinda Kishore. Trailing Persaud heading into today’s final session is another Guyana Open winner Alfred Mentore, who closed the day on a gross 76 and a net 70 after starting on a 6 handicap and Rishi Sukhram with a gross 76 and a net 69 from a 7 handicap. Imran Khan and Brian Glasford follow with a 79 and 81 gross and a similar net of 72 after beginning the day with a 7 and 9 handicap respectively. In the 10-18 category, Seepaul Suknanan playing off an 11 handiap and a gross 76 and net 65 leads this category and he is followed by Roy Cummings with a gross 79 and a net 69 off a 10 handicap and Colin Ming with a gross 84 and a net 70 off a 14 handicap. 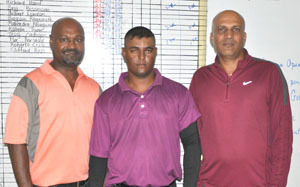 In the 19-28 Flight, Patangilee Persaud heads the field with an 87 gross and a 60 net off a 27 handicap, while Mahendra Bhagwandin lies second on a gross 91 and net 65 off a 26 handicap. Occupying the third spot is Richard Haniff with a gross 94 and a net 73 off a 21 handicap. In the Ladies segment, Joann Deo and Shanella Webster are joint leaders with a net 74 after starting the day with a 20 and 22 handicap respectively. Reigning champion Christine Sukhram trails them with a net 75 after commencing the day with a 5 handicap. Meanwhile, Digicel CEO Gregory Dean, who hit the first tee to signal the start of the tournament in brief remarks said that the Company has always enjoyed being part of the Open, club and golf and thanked the host for allowing them to get on board. President of the club David Mohamed first thanked the members for the hard work they put in to make the tournament possible, while extending thanks to Digicel for its patronage before promising a great tournament. The final day of competition is today and the presentation of prizes is anticipated to be done at 17:00 hrs.